Nearly thirty participants of the St. Nersess Deacons’ Training Program filled the Zohrab Center last Sunday after having participated in the Divine Liturgy in St. Vartan Cathedral. The teenagers and their staff learned about the Center’s history and work. They also perused the Center’s library and rare book holdings, many attracted especially by the extensive collection of early liturgical books and Bibles, including a fine copy of the first edition Bible in Armenia printed in Amsterdam in 1666. Fr. 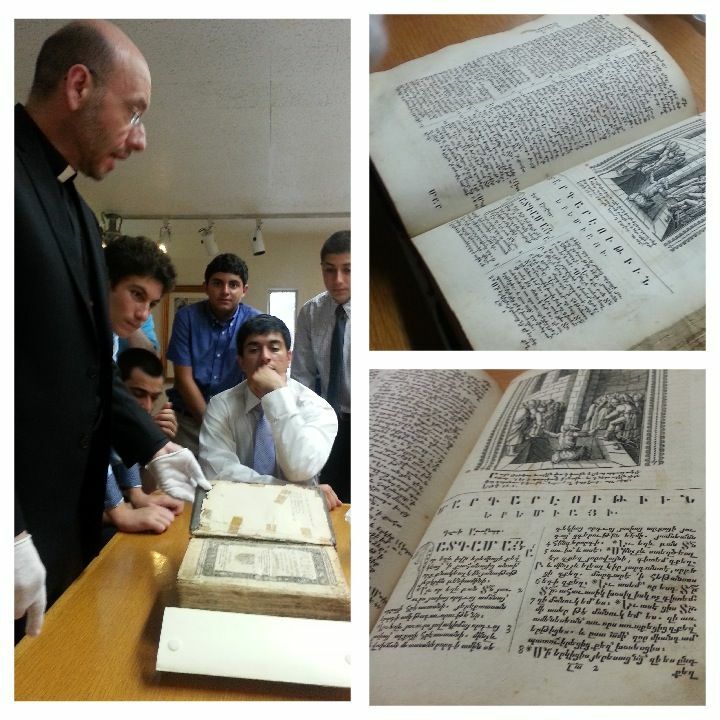 Findikyan displays the Zohrab Center’s prize copy of the 1666 Armenian Bible printed in Amsterdam to rapt onlookers. Fr. Daniel Findikyan, Director of the Zohrab Information Center, has directed the nine-day Deacons’ Training Program at St. Nersess Seminary in New Rochelle, New York for many years.